Knee flexion means bending your leg at the knee joint, reducing the angle between your lower leg and upper leg. Knee flexion is always accompanied by knee extension, which is straightening of the leg. Vern Gambetta, director of Gambetta Training Systems in Sarasota, Florida, recommends doing exercises that incorporate multiple joints and muscles because many activities that you do every day rarely use knee flexion alone. The squat involves flexing your ankles, knees and hips together to lower your body to the ground from a standing position to a crouching position. As you squat, your abdominal and deep spinal muscles brace your torso to protect your organs and spine, and to keep your body upright. Stand with your legs hip-width apart with your feet pointing forward. Hold your arms in front of you chest with your palms facing up. Lower your hips as low as can to the ground while keeping your torso upright. Keep your feet and knees facing forward. Exhale and stand back up without hunching forward. Gambetta suggests that you change your arm positions to adjust the exercise intensity, such as reaching across your body or raising one or two arms above your head. In the step-up exercise, you raise your body to a higher elevation by stepping one leg onto a platform and pushing yourself up. 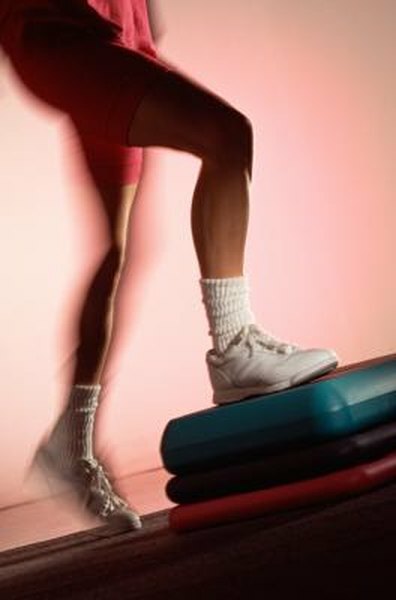 Stack a set of aerobic steps between two and three feet high. Step onto the step with your left leg and brace your spine and abdominal muscles to keep your torso from hunching forward. Exhale and push off the ground with your right foot. At the same time, push your left foot against the step to lift your body onto the step. When your body is at the top of the step and your left leg is straight, extend your right leg behind you without touching the step. Lower your body back down to the ground, and repeat the exercise beginning with the left foot. The lunge is lowering your body to the ground from a standing position by stepping forward with one leg and bending both legs. Like the previous exercises, keep your torso upright and your knees and feet pointing forward. Gray Cook, who is a physical therapist and founder of Functional Movement Systems in Danville, Virginia, recommends that you hold a dumbbell or kettlebell in one hand to challenge your body's stability. For example, do a set of lunges with you left leg forward while holding a dumbbell in your right hand. In the second set, lunge with your right leg with the dumbbell in the same hand.